If you love looking at railway pictures and especially if you don't know the lines this is a great book with which to while away a considerable amount of time. Of the 96 pages only the first two contain text. This book is all about pictures. Only complaint is that the binding makes it difficult to open the pages flat. There are pictures of all sorts of workings, diesel and steam, service, freight and railtours over the last four decades. It's fascinating to see how much has changed in railway terms, while the scenery has, of course, remained beautiful. The Kyle Line is famous for its scenery, the Far North Line less so, yet here we see just how varied its offering is too. 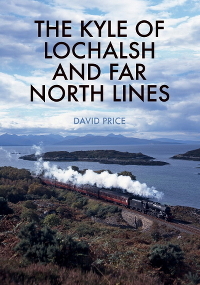 The book is divided between the two lines in a very satisfactory way, beginning in Inverness, taking the whole route north to Thurso and Wick before picking up again from Dingwall to follow the Kyle Line to the end. This reviewer was especially pleased to see not one but TWO photos of the erstwhile, and hopefully soon to be again, Lentran Loop. One of them is used for the back cover. A not-too-subliminal message for the Transport Scotland decision makers!